To meet the demands of various applications, depth filters can be supplied with options including water removal, pharmaceutical grade material, or polypropylene filter media. Water removal is achieved using the ZetaDri-Pak filter cartridge for oil based products and with the AquaKv-Pak for transformer oil filtration in the electric utility industry. By providing a separate material to remove at least 84 ounces of water per 9-cell Pak, this concept provides dual phase separation, removing not only water but also particulate contaminant. The ZetaDri or AquaKv option is available with any grade of media. Polypropylene filter media can be used in place of the standard cellulose-based filter media for products that are not cellulose compatible. Manufacturing the cartridge with the polypropylene core style results in an entirely polymeric filter element with your choice of Buna-N, Neoprene, Viton, Silicon, or Teflon Encapsulated gasket. Zeta-Pak – High flow rate, positive electrical charge, and superior retention of ultrafine particles. ZetaDri-Pak – Ability to capture free and emulsified water from your product. 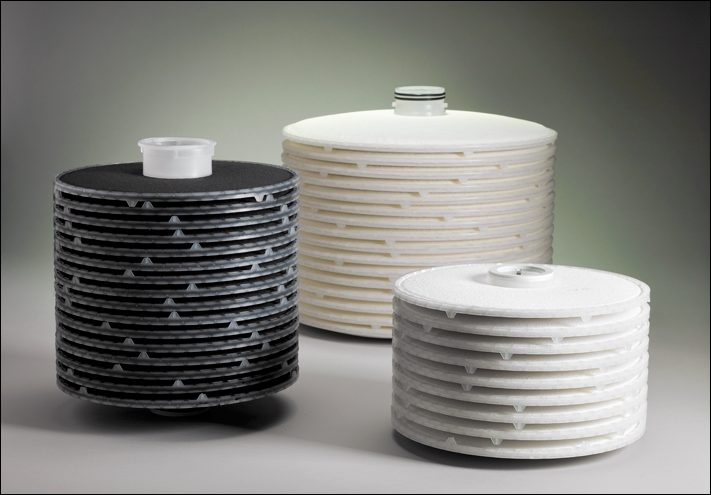 Disc-Pak – 100% Celluslose – Filtration of liquids in the light to medium viscosity range. Bio-Pak – Pharmaceutical grade media with double-O-ring gaskets. AquaKv-Pak – For the retention of water contamination in transformer and turbine lube oils. All Pak® cartridges utilize ErtelAlsop depth filter media, which provides a wide range of particle retention with high solids loading capacity. Nominal retentions range from 0.25 to 15 microns. The complex matrix of fibers and particles of filter aid create a structure which allows for greater concentration of particles than most surface retention filter media. All ErtelAlsop filter media with filter aid and/or carbon exhibits a positive Zeta-Potential over a wide pH range. This allows for the removal of negatively charged particles smaller than the pore size of the filter media, providing additional solids loading capacity. Pak® elements use cellulose/filter aid media, polypropylene, stainless steel, and appropriate elastomers, which allow for excellent product compatibility. ErtelAlsop also offers the Pak® with polypropylene filter media, if cellulose or filter aid are not compatible with your product. Media Formulation: Alpha-Media – 100% Cellulose, Micro-Media – Cellulose with filter aids and wet strength resin, Micro-Media: L Series – Celpure® High Purity Diatomaceous Earth, Micro-Media: XL Series – Celpure® High Purity Diatomaceous Earth, Micro-Media: LXL Series – Celpure® & High Purity Cellulose, Micro-Clear – Cellulose, D.E. & Activated Carbon, Pharmaceutical Grade Media – Lot traceable back to the raw material suppliers.